Here's the thing, if someone gives you some information and asks you to read it and consider it because it might give you a better understanding of the person you are dealing with. Do you read it? Do you take the time to try and understand your partner better or do you dismiss it and return to your standard stance of "It's not me, it's you"? Because I would tend to lean towards actually wanting to learn how to make things better. But that's the difference between intellect and ignorance. The intelligent person is keenly aware of how little they really do know whereas the ignorant person holds on to those beliefs like a life preserver without regard to new and contradictory information. 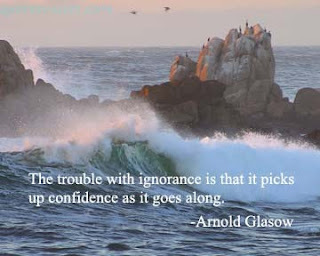 The ignorant person has no choice but to stubbornly cling to what "knowledge" they have despite it being incomplete or outright wrong. There's more to this, of course, there always is. There's a confirmation bias across all strata of intellect, that is, we all tend to think we are smarter than we really are but, as the level of intelligence rises, the margin of thinking we are smarter than we are comes down. Another way, the dumber a person is the more likely they are to overestimate their intelligence. The smarter a person is, the more likely they will be to be able to recognize that they don't know something. Here's some more reading on the subject if you are so inclined (which is actually a sign that you're on the upper end of the spectrum because intellectual curiosity requires, you know, intellect). Incompetent People Too Ignorant to Know It.